This was originally released on a limited edition vinyl LP on the Kommun2 label earlier this year in 300 copies. I think it is still possible to find a copy around but it is getting scarce now. Anyway, this is the digital version and it also features an extra 16 minute track called Smokin’. This was actually my favourite release in 2009 and it is nice to see it released in a nice digipack for the fans that are not into or can’t play vinyl records. The opening track, Demons and Haze, is an amazing composition with great dynamics. A real progressive space rock classic. Turn left to the Mexican BBQ, is more instrumental but also very cool with male-female vocals and acoustic guitar to start before taking a turn left. 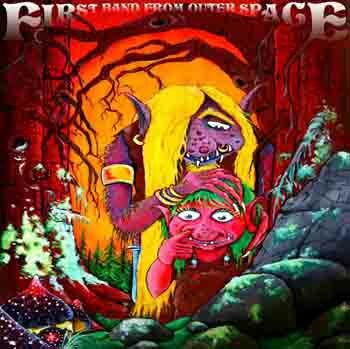 The band still has that Hawkwind influence but they really do space rock their own way. The long 20 minute title track is simply amazing. Very dynamic and it has so many parts. Cool stuff. Smokin’, the new addition here, has a nice rolling bass line and very spacey vocal style in the beginning as the track travels forward and Johan lays down some awesome lead guitar. The gypsy music part is super cool and really catches you by surprise. A great evolving track and cool addition to the music from the vinyl LP. For all space rock fans.